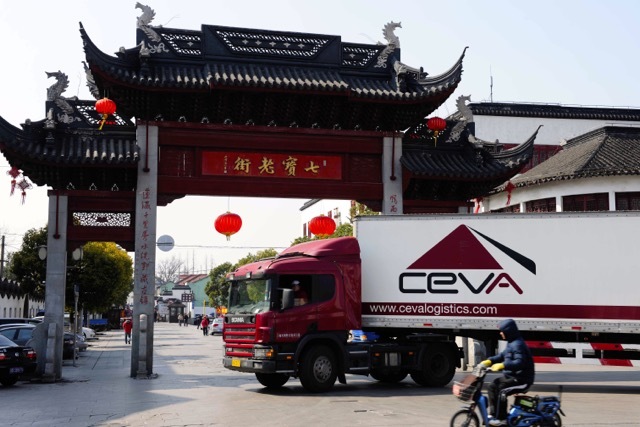 Trucking services between China and Spain – that’s CEVA’s latest “innovation” in long-haul overland haulage. Plans that were announced some days ago and warmly welcomed by industrial manufacturers and some media members. The sad side of this story: Climate change, global warming, melting of the pole ice caps – these and other aggravating environmental threats don’t seem to play a major role in CEVA’s transport policy – if any. Congratulations CEVA. Well done! Global climate will laud you for deciding to truck goods across the vast land bridge spanning from China to Spain! There are no doubts about the operational feasibility of your project. That the trucking project works was proven by two trial runs: the first conducted last November, the subsequent haulage in March. During the latter, 70 cubic meters of garments were carried by road from the Far East to the Iberian Peninsula, equivalent to a weight of seven tons. The consignments were destined to retailer Zara based in Zaragoza, Spain. But is your truck project suited to the present time? It’s more than questionable. Particularly since the pilots will soon lead to regular line-haul services operated all across Eurasia. This will lead to substantial greenhouse gas emissions, supporting global warming. sending a truck on a 13,600km journey at an estimated cost of 10,000 euros from China to Spain. Will the trucking option change logistics flows? However, the environmental impact of their trucking project is not mentioned by CEVA in their announcement. No word about greenhouse gas emissions. An inquiry to their UK-based press agency requesting specs on their ecological footprint caused by the intended transports remained without a response. Instead, CEVA managers prefer to pat themselves on their backs, announcing plans to “further extend our trucking footprint through this unique service. The TIR trucking will change our customer’s logistics flow significantly,” predicts Torben Bengtsson, Executive Vice President of CEVA Logistics North Asia. CEVA’s main argument: transcontinental road transports are about 50 percent cheaper than air freight and run 30 to 50 percent faster compared to cargo trains. How costly for the environment these transports are, CEVA omitted to say. Sending a 40 Foot Container overland, is equivalent to 50 containers by rail and even more by ocean freight. The average truck eats up 33 liters / 100km of diesel according to numerous sources from the trucking industry. This of course varies slightly depending on the vehicle model, the emission category of its engine, the weight carried etc. But leaving the negligible features aside, a burn of – say – 30 liters per 100 kilometers leads to a total consumption of 4,080 liters of Diesel – minimum – to master the 13,600 km distance between Southern China and Spain. Each liter of Diesel fuel burned yields about 2,6 kg of CO2. A single CEVA truck running from Southern China to Spain blows a total of 10,771 kilograms of carbon dioxide in the air! The trucking project proves anew that ecological aspects don’t seem to play a role in CEVA’s business model. For instance, there is not a single reference to activities aimed at reducing greenhouse gas emissions and improve the company’s ecological footprint in any of the company’s press releases published between 2017 and today. This leads to the conclusion that the company turns a blind eye to ecological aspects. Meanwhile, CEVA published their 2018 sustainability report, the first since 2015. In the preface of the 44-page overview the logistics company states: “Our commitment to sustainability helps us to decrease our environmental impact across the entire value chain. We incorporate environmental considerations in a variety of areas, from warehousing operations and transportation, to solution design and procurement.” How much their upcoming transcontinental trucking solution impacts the environment is not mentioned in CEVA’s sustainability report. Despite the fact that the project was set on track last year.